Want to upgrade your axe in premium 3M™ Carbon Fiber and get the most heavy metal look imaginable. Choose from Black, Anthracite or White Carbon Fiber with a real texture you can feel. Great for hiding damage, scratches and blemishes in your guitar's original finish. 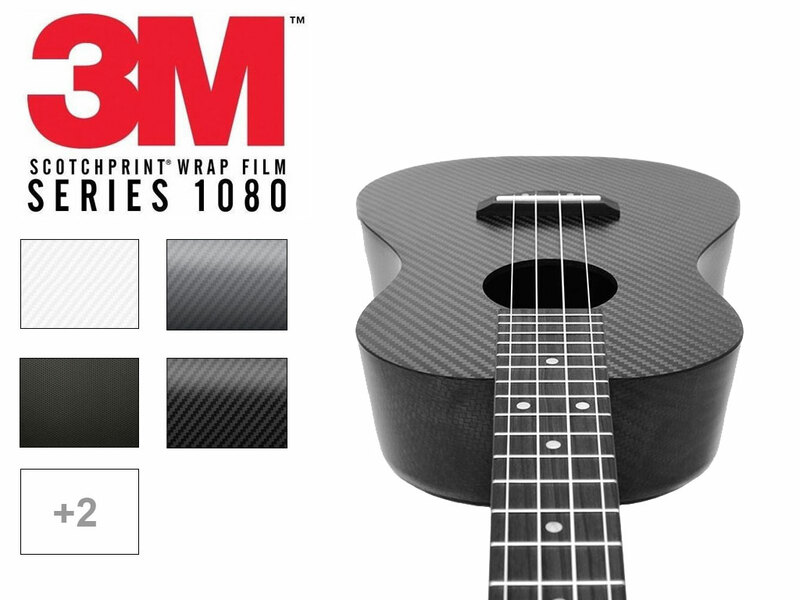 Install with ease due to its air-egress liner and enjoy the long-lasting durability of these Carbon Fiber Guitar Skins. Upgrade your axe with a Matte Removable Guitar Skin from ORAFOL. Made from a specially formulated, removable vinyl that won't damage your guitar's finish, you'll love the look and the low, low price too. Choose from a variety of flat, matte colors and wrap your acoustic, bass, ukulele or electric guitar for a day, week or even a few hours. Is your axe truly metal? 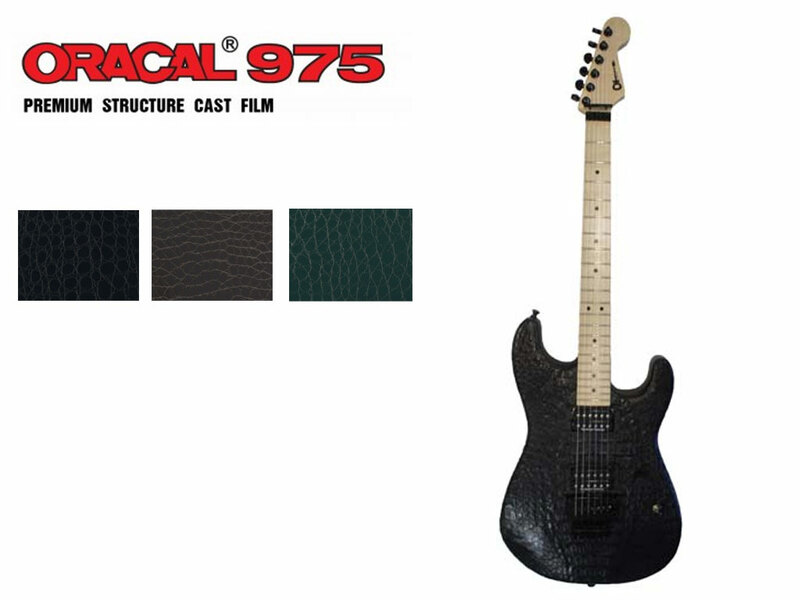 If not ad the look of real dragon skin with one of our ORACAL&REG; 975 Crocodile skin guitar wraps. Choose from three great colors and marvel at the three-dimensional texture of the scales you can actually feel. Why buy a digitally printed guitar skin for your bass or acoustic guitars when you can get an ultra-realistic, alligator skin wrap for less. 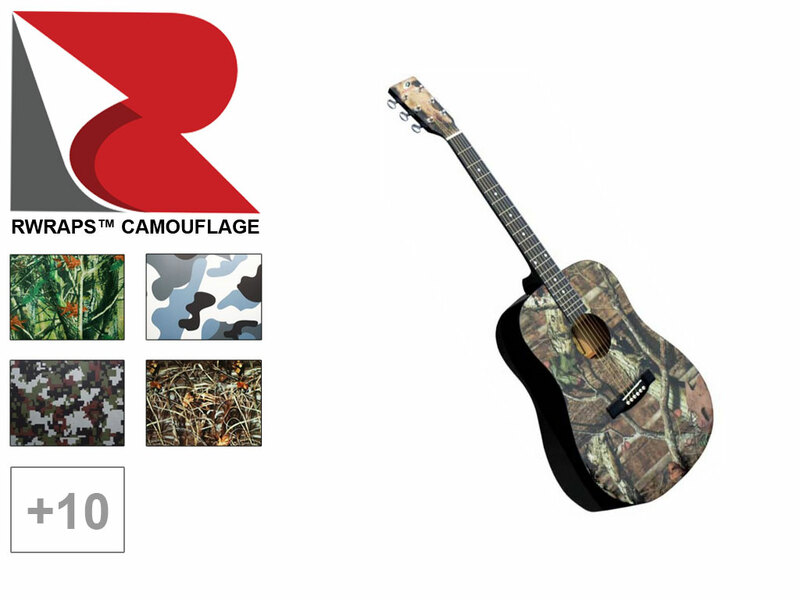 Upgrade your acoustic, bass or electric guitar with a Camo Guitar Skin from Rwraps™! Choose from over a dozen different styles of camouflage from mossy oak-inspired, real tree patterns to digital to arctic camo as well. Buy by the foot and take advantage of these wraps air-release technology. Do you have an old acoustic guitar with a peeling finish or an electric guitar you want to freshen up with a color change? You could try painting or refinishing your instrument, but get ready for a crazy learning curve. You will also spend a lot of time and money. 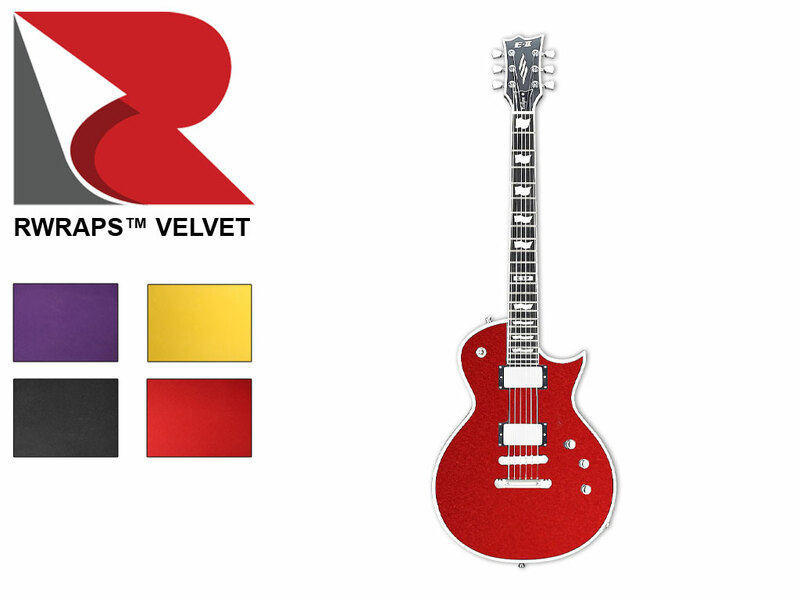 Unless you want to cringe over the prices of a new investment each time you want to alter the guitar's look, there's an easier way to get a cool finish — use one of Rvinyl's quick and easy color-change guitar wraps! Are you still on the fence? 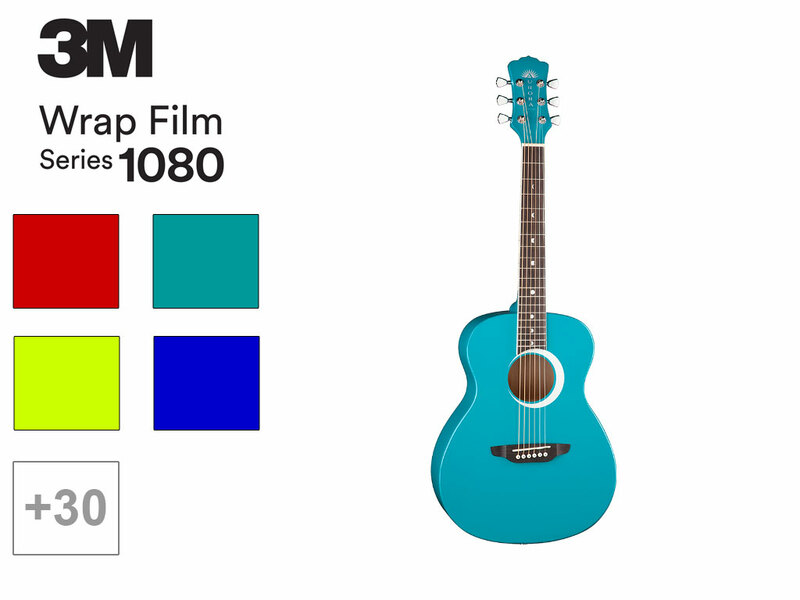 If our 3M™ Gloss Atomic Teal Guitar Wrap is good enough for Kelsea Ballerini, then we're pretty sure it will work for anyone. Guitar films are a sheet of vinyl that covers the original skin of your instrument, giving you the freedom to change its appearance as many times as you wish. You may hear people refer to skins as a guitar wrap or film. They can take your axe's look to the next level. Instead of appearing like all the other guitars in the shop and on stage, yours can make people drool over its customization. You can cherry-pick from sick images, bold patterns or solid colors. The vinyl has an adhesive backing that provides for a smooth installation process free of bubbles. Not only do our decals amp up the look of your guitar, but they can also hide damage, scratches and blemishes, while even smoothing over the roughness of any dents or nicks. Vinyl is a pressure-sensitive material that activates its adhesive properties only when you apply force. It's also an air-egress decal that gives you a professional installation thanks to the cross-haired air channel pattern. There may have been 2.6 million acoustic and electric guitars sold in 2017, but no guitar, then or now, will look like yours when you rely on the Rvinyl professionals and our array of customization options. At Rvinyl, we pride ourselves on carrying one of the largest selections of craft, sign and wrap vinyl anywhere. As a result, we're able to offer you a wide variety of choices when it comes to custom guitar skins. Choose from 3M™ 1080 Series Guitar Wraps, ORACAL® 975 Crocodile or Honeycomb Guitar Skins or go for a more traditional look with our Rcraft™ Wood Grain Guitar Refacing Films. Need a temporary solution for a gig or party to wrap your acoustic or electric axe? 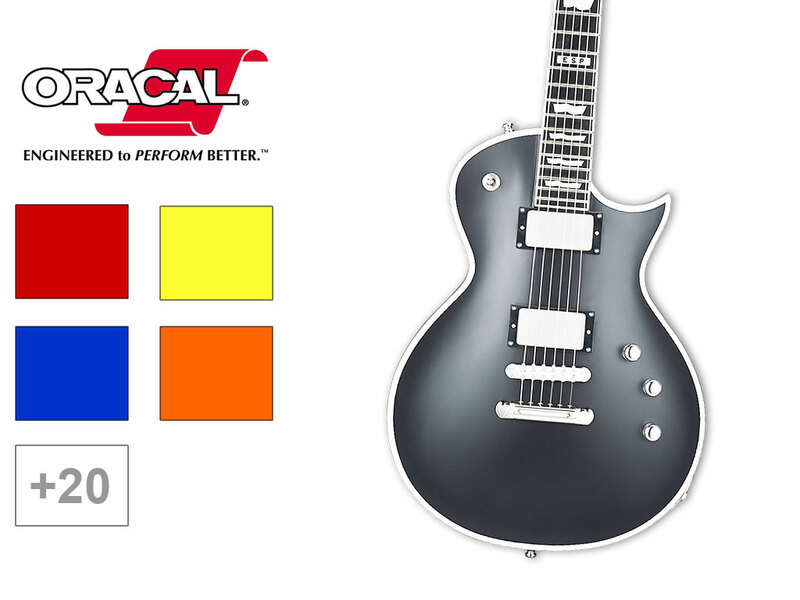 Try our ORACAL® 631 Removable Guitar Skins. Our guitar stickers breathe life into your acoustic, electric or bass guitar — whether you jam at home, bang out a few songs with your buddies or play professionally. With Rvinyl's finish, your guitar gets a professional and personalized new look. Full of color, intricate designs and high-definition graphics, our decals can hype you up with a new vibe. 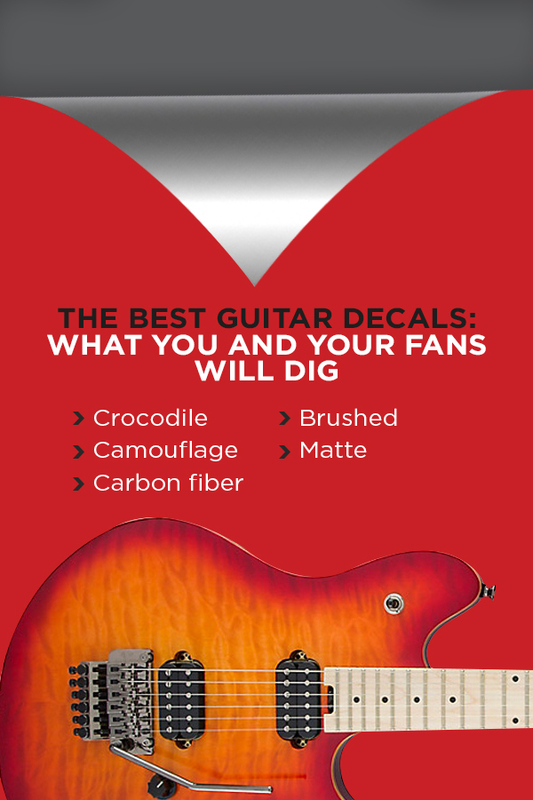 Crocodile: Rvinyl's croc decals bring your guitar to an innovative level with an insane texture. As a 3D material, the croc vinyl seems like the real thing because you can feel the bumps and scales. Choose from realistic colors such as green, black or brown. Croc skin gives your guitar a hard look that's the real deal. It's a style you can rock with on stage or at home. Camouflage: Camo isn't just for hunting and the outdoors. Your options are endless, ranging from desert, arctic, blue, green, marshland and tree to digital, swamp, back country, backwoods, grass blades and neon green designs. You can opt for traditional camo or choose one with a refreshing twist to suit your axe. The desert vinyl has a four-toned camouflage pattern with triple-ply technology to give it the right depth. We take inspiration from real images found in nature to give you genuine coverings. Carbon fiber: Choose from shades like silver, yellow, black, white, anthracite, red, blue or transparent. Made from holographic patterns, Rvinyl carbon fiber decals are available in various sizes. The anthracite design gives off the imagery of woven graphite. When you apply carbon fiber vinyl to your trusty guitar, it provides a 3D appearance that looks like real dyed graphite. Even transparent is incredible if you already love the color of your guitar but want a lit pattern over the top. Brushed: When you squeegee out the last air bubble on the base of your guitar, you won't even be able to tell the difference between the brushed vinyl and the exact look of brushed fibers. The 3D decal has a metallic flake and works as a dual-layered film for professional results. You can even feel the grain of the brushed vinyl whether you want titanium, steel, aluminum, black metallic, bronze or gray. Matte: Matte is one of the most popular trends among owners of gadgets, cars and gizmos of all kinds. From adhering matte black vinyl onto vehicles or upgrading the look of a phone, matte can add a sophisticated and classy look that's unmatched by anything else. Choose from black, purple, teal, indigo, silver, red, bronze, gold or blue matte vinyl to wrap your ride-and-die axe. Make it professional at half the cost of other guitar refurbishing options, whether you want to change the appearance of your instrument depending on the new music you're writing or you're vamping up the presence of your band. Apply red for an electric sense or punch it up a notch with teal to make heads turn. Our decals give you a modern finish while helping you keep extra change in your pocket. There are a few other companies out there that offer true custom or trim-to-fit solutions for wrapping your electric, acoustic or bass guitar. But just because there are pre-cut options doesn't mean they're any easier to put on. In fact, you have to be pretty darn accurate to get it on right. We deliver uncut guitar skins for a simple installation process. All you have to know are the measurements of your guitar, and then you're good to go. If you're someone who likes to take matters into their own hands, Rvinyl guitar decals are ideal for DIYers. You don't even have to be an experienced vinyl applicator to get it right. All you need is a killer wrap design from us, and you're already halfway to a fresh look. Plus, there's another reason to buy your guitar skin from Rvinyl — we have textured wraps. Every other company we know offers digitally printed skins for guitars. But what if you want something a little more unique? What if you want a crocodile skin look with a true-to-life feel or to get the look of carbon fiber with a 3D texture? If you go anywhere else, you'd be out of luck. We have all you need and more at Rvinyl. With graphics that pop, our wraps allow you to customize an electric, acoustic or bass guitar, or even a ukulele, so you don't have to rock with the same boring look each time. Choose the right model for your axe and get a hand-crafted look that can fit any model and size. Our products can last for several years if you take proper care of the decal, and they are removable whenever you want to switch to another look. People who love music want to look good while they play it. Music allows you to showcase your individuality. It lets you tell everyone who you are, through what you play and what your instrument looks like. That's why you see so many professional guitar players with customized basses or acoustics. They express themselves through chord progression as well as what they bring on the stage. When you buy guitar wraps from Rvinyl, you get a chance to join them. Trying out daring new appearances: Do you have a stage guitar you pick up when you have a big gig? Do you frequently get nervous when you play on stage? Adopt a new persona that's big, bold and daring, and channel it by finding a guitar wrap to match. You'll gain confidence when you take the stage, and your wrap will remind you to keep pushing to that new comfort level. Protecting your guitar: The advantages of vinyl skins even surpass the thrill of boosting the physical appearance of your favorite guitar. Guitar wraps protect the original finish of the instrument and are durable enough to withstand any jam sesh. They're also a cost-effective way to change the appearance of your collection without having to invest in a new style each time. 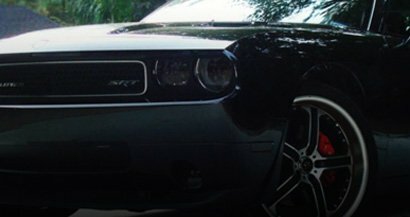 Finding tons of affordable options: We give you an affordable option that provides you the freedom to go from vibrant and electrifying to dark and menacing to bold and over-the-top. Don't waste your time or money on expensive paint jobs or brand-new instruments. Change up the body of your guitar as many times as you want without igniting a hole in your bank account. Catching people's attention: Do you want to stand out? Then a guitar skin will help you do it. Bold colors and patterns combined with your unique swagger will show people they should keep an eye on you. Making what's old new again: When you feel uninspired, do you ever think about getting a new guitar to help you get stoked again? That can get expensive. It's a lot cheaper to make changes to your existing guitar to give you the new edge you want, instead of trying for a new instrument. A guitar skin transforms the look of your guitar, so it feels fresh but won't cost you a lot. Having fun: Never lose sight of the fact that music should be fun. You may do it as a hobby or a profession, but either way, you should enjoy it. A guitar skin reminds you of this. New vinyl for your guitar should inspire and excite you, and that will come through in the great new songs you write and perform after you get your film. No matter which vinyl DIY installation technique you try, Rvinyl wraps will create a seamless finish that you'll want to show off to everyone you know. Our vinyl decals allow you to take pride in your work. Want to show off your handiwork and get a nice reward? 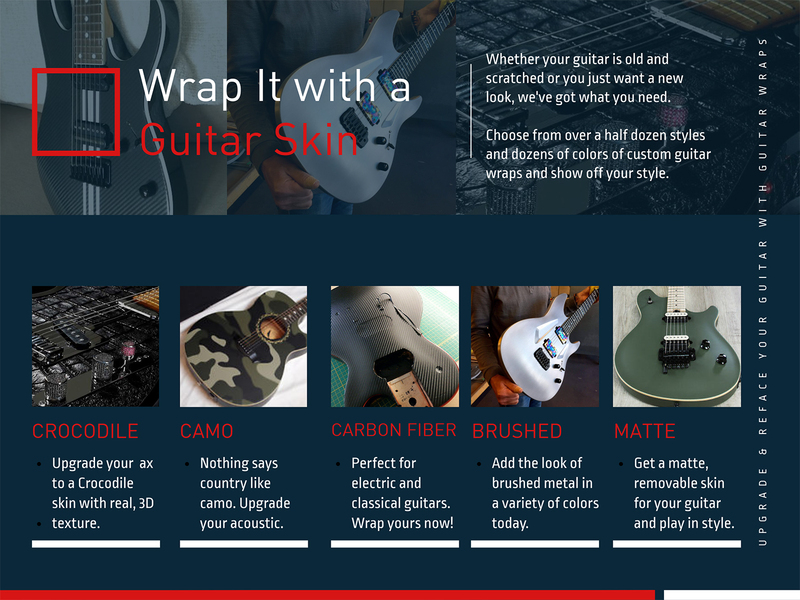 You can submit a photo of your wrapped guitar, and we will add you to our product rebate program. It's a win-win. Preserve the value of your guitar, save money and be the guitar player everyone wants to jam with. Browse our hundreds of options whether you want to rock out with an improved look for fun, have an awesome gig to attend or need to upgrade the image of your band. From arctic camo and green croc skin to black matte, our vinyl is available in diverse shades. You can customize your guitar decal to last several years, months or even a single day. We combine style and affordability, so DIY enthusiasts like you can personalize the exterior of your guitar. Shop at Rvinyl and receive free shipping if your order surpasses $59. Reach out to us online for more details on our vinyl wrap skins or chat with us live for immediate answers.